In addition to repairs, we sell Riccar vacuums. With this quality line of American-made vacuums, you get metal components instead of the plastic pieces in lesser vacuums. 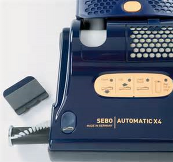 Did you know that with each passing day your vacuum cleaner looses cleaning effectiveness? Most vacuums use a "stretch" belt which stretches whether the vacuum is turned on or off. At 3-6 months a typical stretch belt could be down to 50% cleaning efficiency, cutting deep cleaning in half. Filters, used to reduce in home polution and dust emmisions, must be either washed once every 3 months or replaced annually. So many vacuum cleaners get tossed out into our overflowing land fills when all they need is some professional TLC. When you visit our shop, we'll be glad to demonstrate the incredible power of a Riccar vacuum. Riccar makes some of the best home vacuums, and you'll be impressed when you see one in action. Come in for a free demoYou make take it home and try it before you buy it. We accept trade in's for credit off of new purchase. When you come to Ace Sewing & Vacuum for service for your vacuum cleaner, you get our 90-day warranty on our labor. When your vacuum doesn't pick up dirt the way it's supposed to, call us.